If you are here for this tutorial alone, scroll down to the dashed line. PDF download available below. I know the basics of bead knitting, but because I often dislike sparkles, I never tried it. But last week I finally realized what to do with the 200 yards of Jojoland Cashmere I'd purchased for $20 from my LYS during a summer sale last year, and I wanted beads. I couldn't do hook-as-you go because my smallest crochet hook is 1.25mm, which is nowhere near small enough for me to pull a seed bead through, and I also wanted to have many beads ready at a time to avoid inconveniences like tedium, increased spillage risk, and having to take my eyes off Star Trek: The Animated Series. So I came up with a method using tools you have on hand already: waste laceweight yarn or thick thread, a thin needle, and your project. I entered a SUPER Mystery KAL- I say "super" because we only know yardage, yarn weight, needle size, and that we need beads for hook-as-you-go on the third month of the KAL. [Sign-ups for that darling end 31 January, apparently.] I figured that I might as well use the beads, and that got me thinking- what else could I do with beads? Well, it was very cold last week, so I wanted more warm, but still light, scarves and cowls. And when I was searching my Ravelry library for bead inspiration, I caught sight of Whorl, and I KNEW I wanted to make it in my precious cashmere. So I bought the beads, and ta-da! that was that! Wrong. Like I said above, my smallest crochet hook was far too big, plus I'd never heard of 3-in-1 dental floss, and I can't fathom using flossers to bead. So I got creative...ish. I got my 6/0 Czech seed beads that I'd just purchased, fished around for a suitable needle and a suitable yarn, and came up with a solution for my own whorl. Please forgive a couple of the photos, they were taken on my phone. At least most came out fine! heavy laceweight cotton yarn or thread for threading. I used a cotton 2-ply that fluffs with repeated use. If you find something that works as well as cotton, let me know in the comments and I'll add it in here. 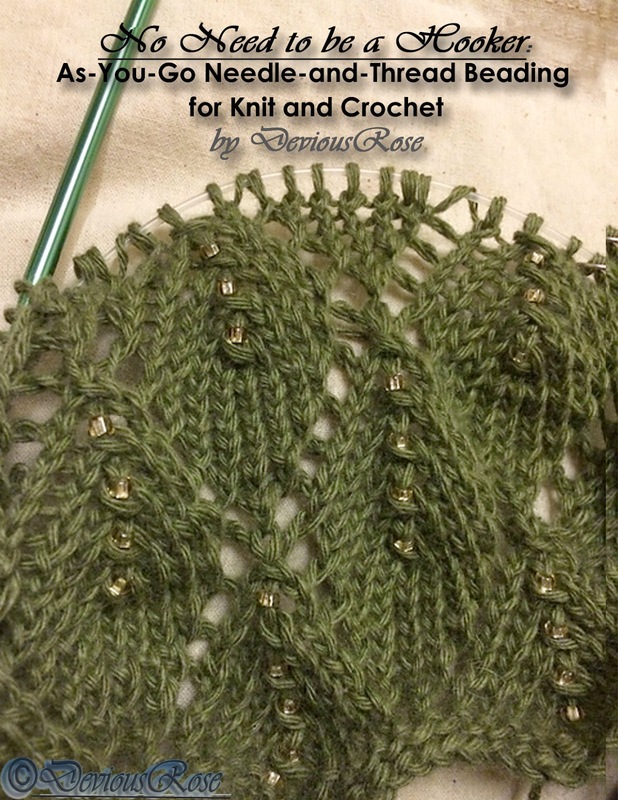 your knitting or crochet project! 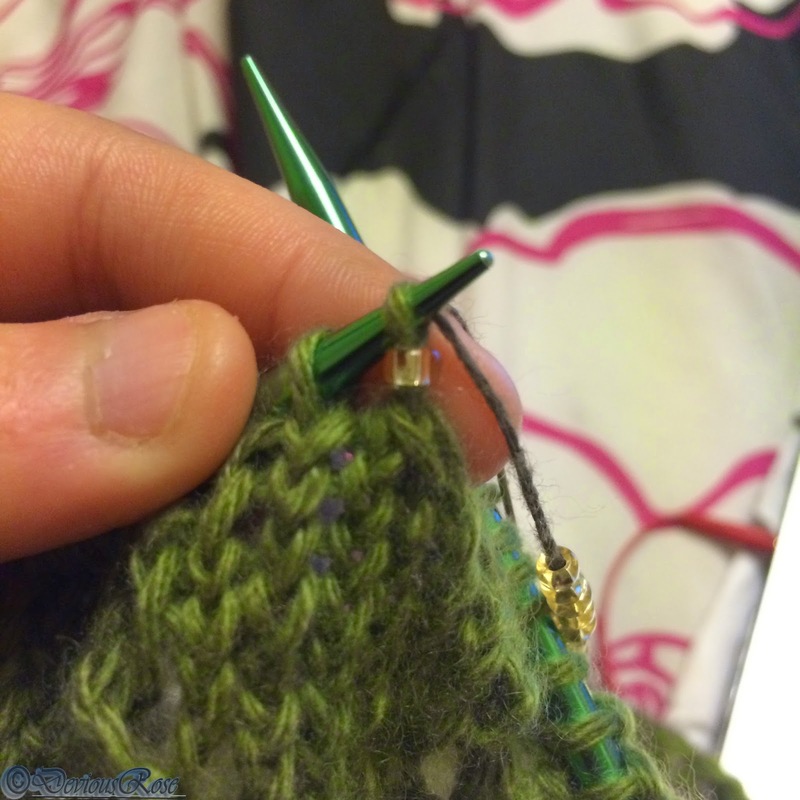 Notes: Like hook-as-you-go, this will give you a slightly elongated stitch in knitting. 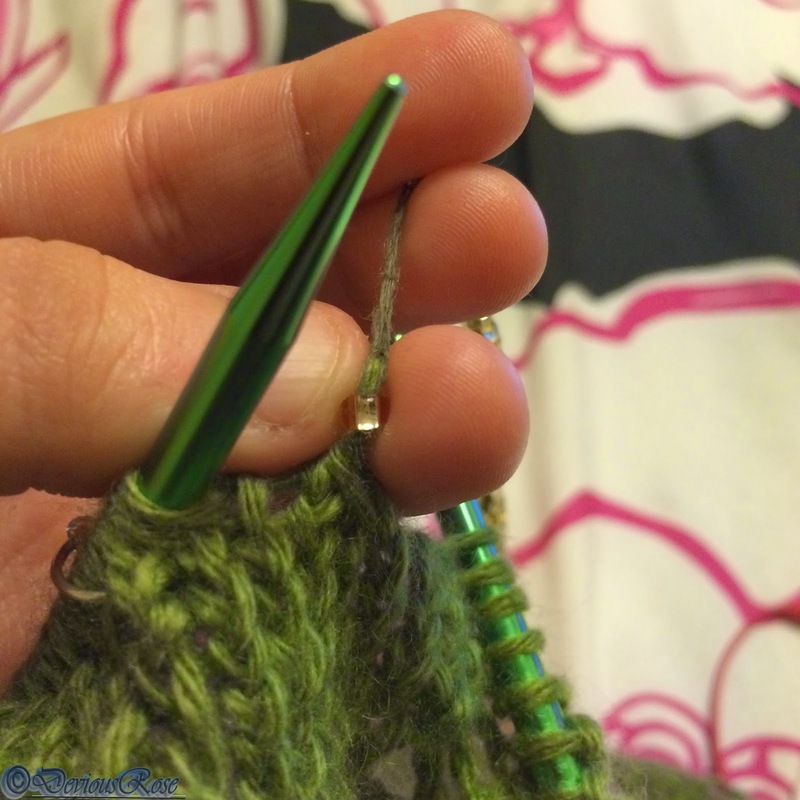 For a less elongated stitch, pull and push the bead more gently and IMMEDIATELY pull the needle out. Thread must be something that'll allow the beads to fit through four strands of it + the needle and have enough slippage to get onto your project yarn easily without shedding, thick enough to keep the beads on there if you should accidentally knock the needle over, and sturdy enough not to break under this repeated strain. 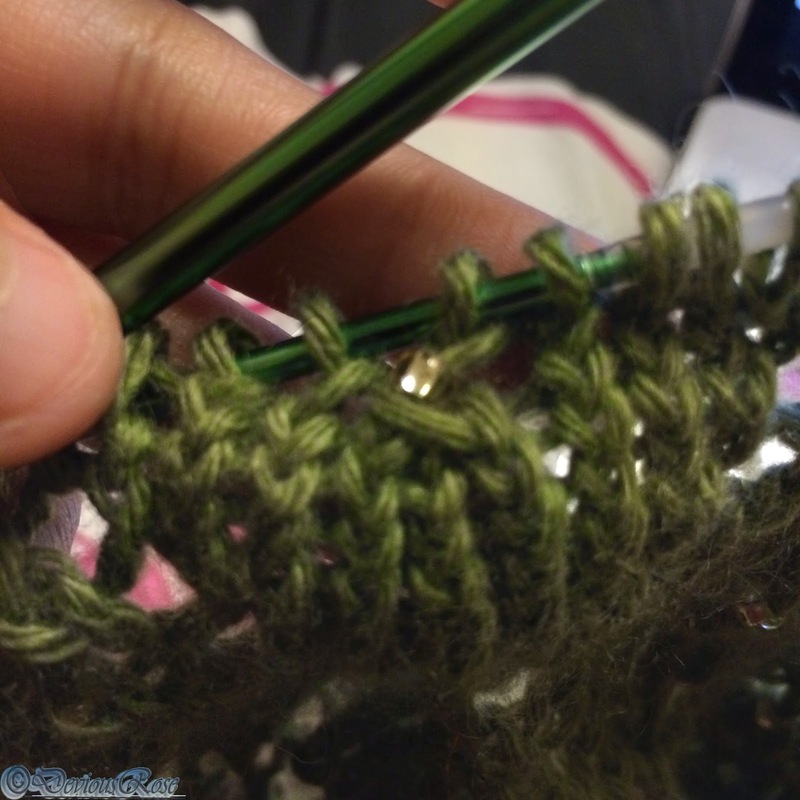 This method will have very different results for crochet than for knitting, depending on what portion of the stitch you add your bead too. This allows for more creative possibilities than for knitting. Knitters, fear not! That just means you have an added challenge! For WHERE to stick your beads (in knitting) to get them to show up the way you want them to, you can try endless swatching or trial-and-error, or you can go over to http://spinspinspin.wordpress.com/2011/08/18/knitting-with-beads/ (also linked above), which covers a few methods for bead knitting and has a very detailed discussion, notes, and even diagrams of where to place your beads. I used this to go straight into my pattern without swatching and the results were just as envisioned. 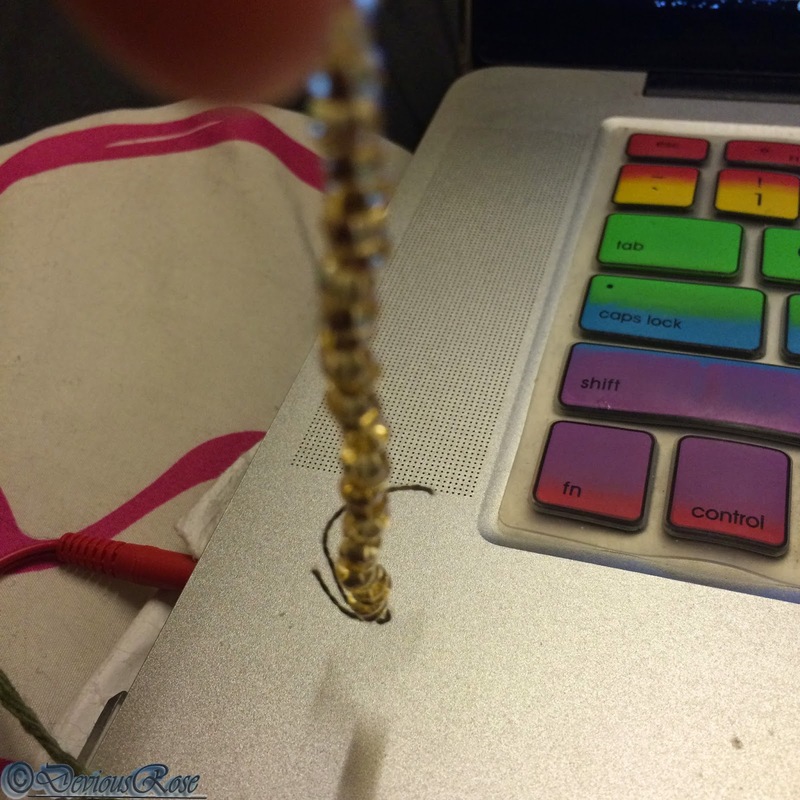 2) Thread on your beads. 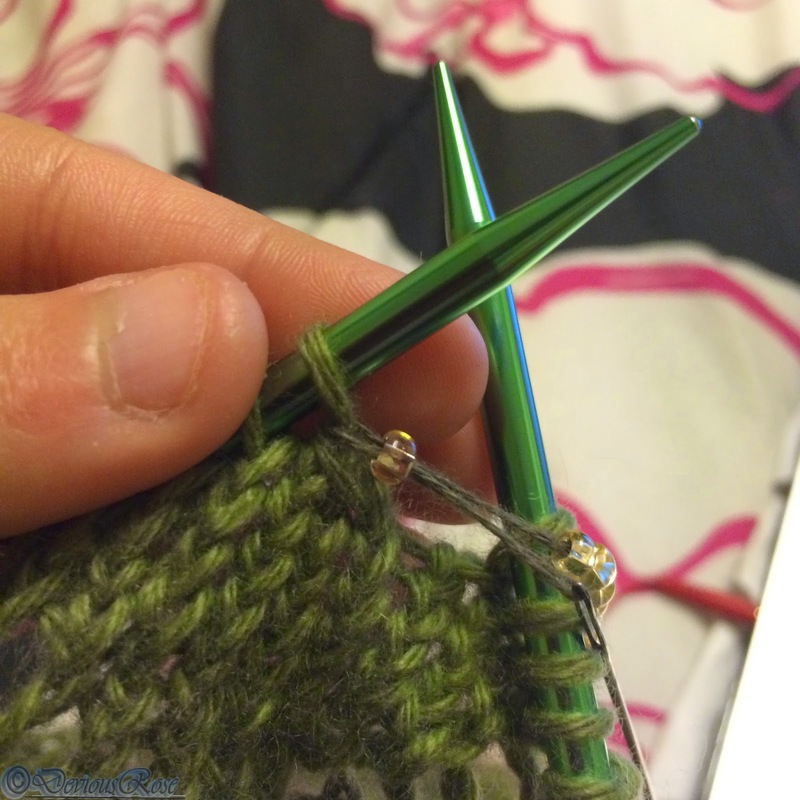 Make sure your needle has enough room to maneuver into the top bead and come back out. 3) Work to the stitch you need to bead. In my case, it was the sssk from the previous row. 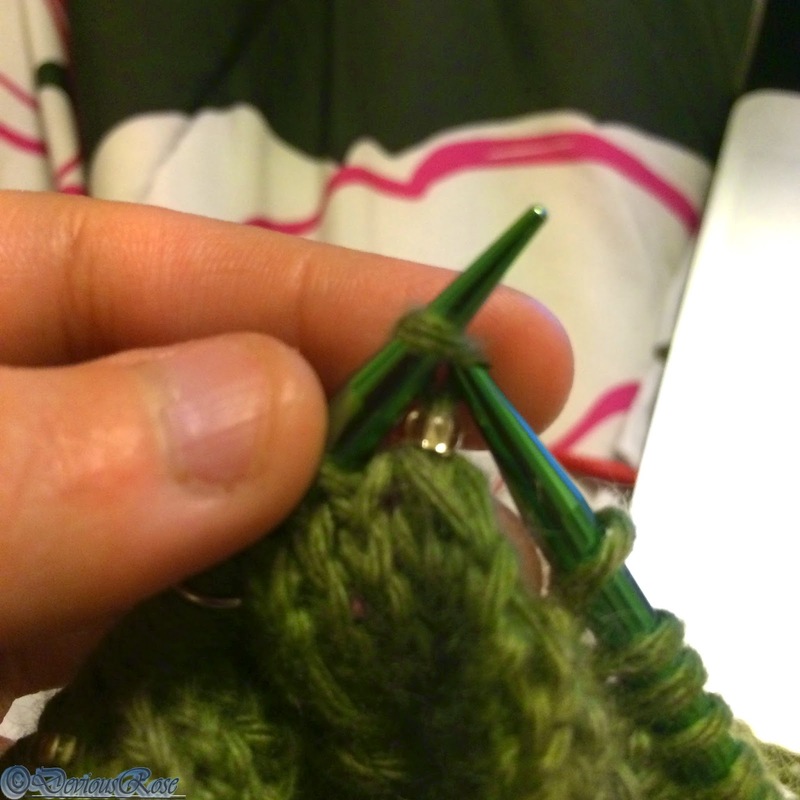 For crochet, you will have to remove your hook. 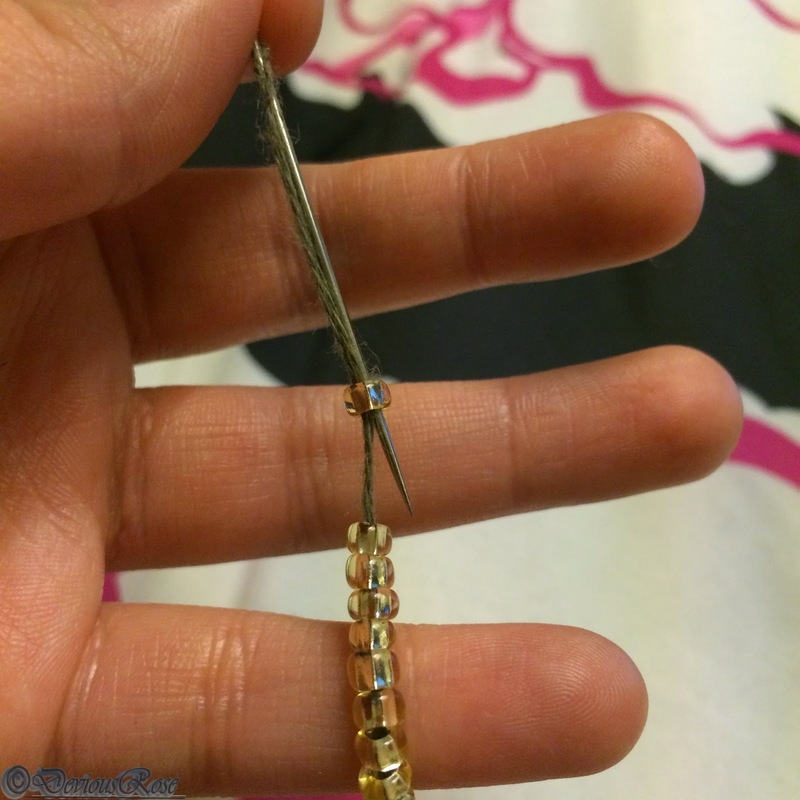 4) Insert the needle through the stitch and pull it through the top bead on the beading strand, then push the bead down onto the stitch while also pulling up the needle and the other end of the strand. 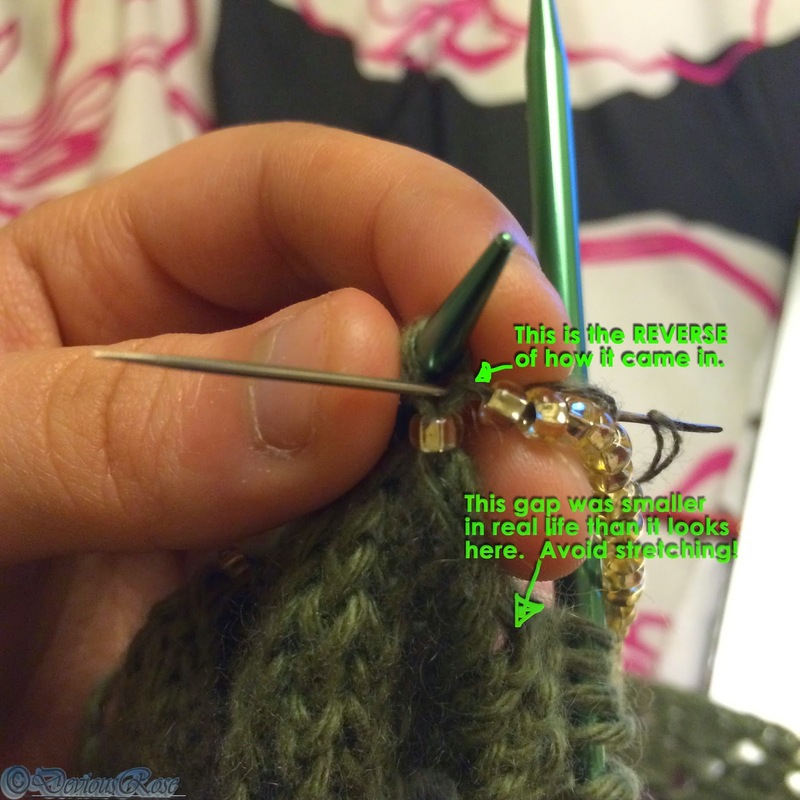 Then place the stitch back on the needle. 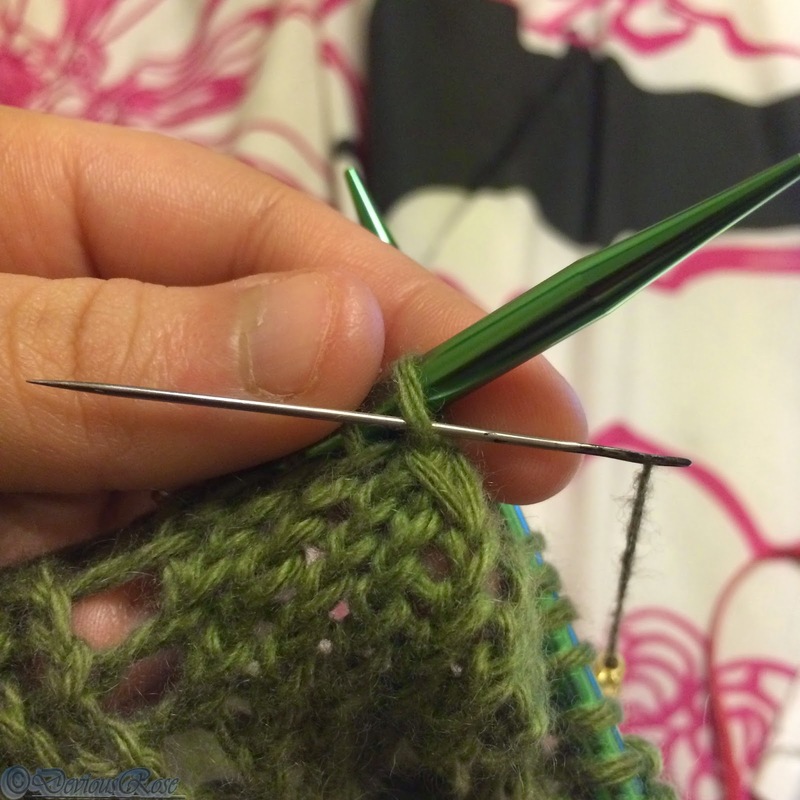 To get a less elongated stitch, pull and push more gently and IMMEDIATELY take the needle out. 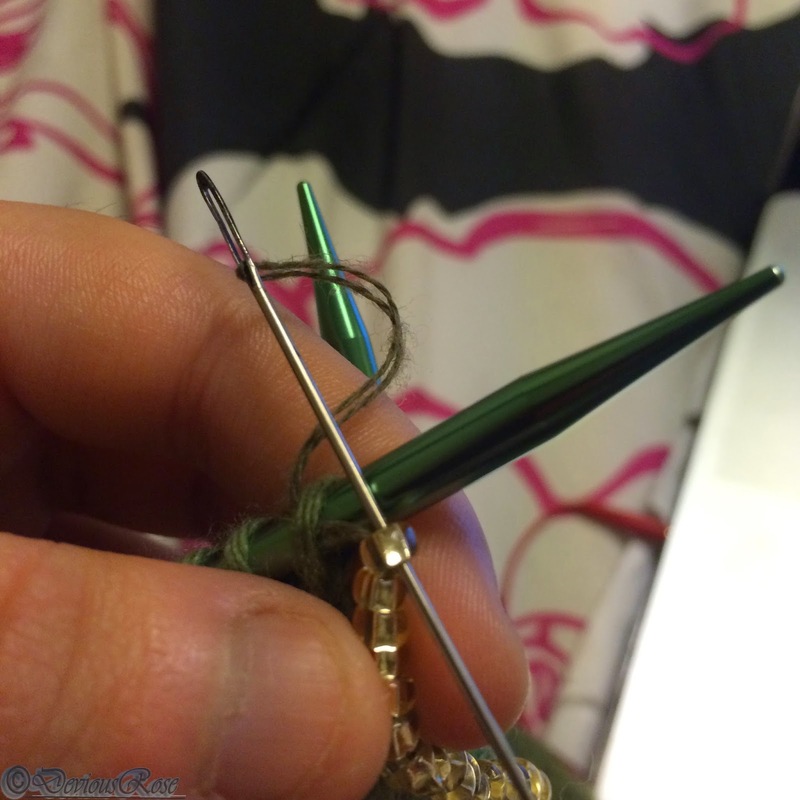 5) Once the beaded stitch is safely back on the needle, pull the needle out the same way it went in. Just knit it. Just knit it. No one wants the bead defeated! 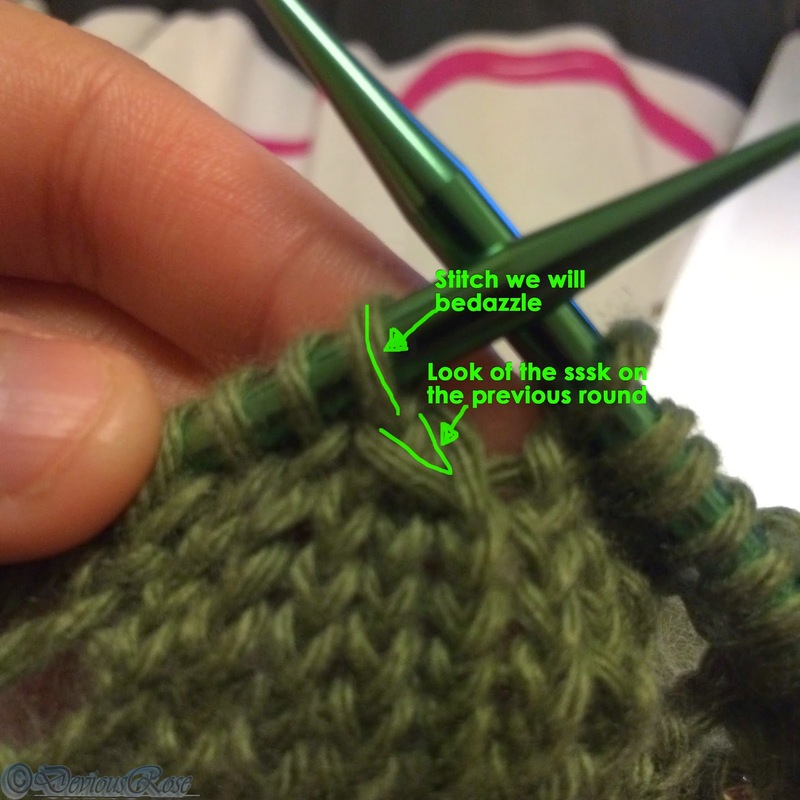 6) Work the stitch and continue pattern as established.